The homestead hall tree and bench is constructed of hardwood solids and cherry veneers. 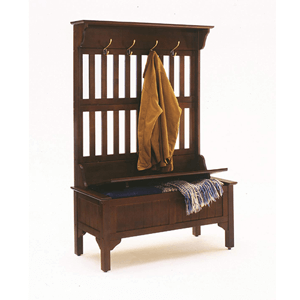 This handsomely designed hall tree and storage bench in cherry finish will provide convenient storage for the hallway. This handsomely designed hall tree and storage bench in black finish will provide convenient storage for the hallway. Let the Bush Furniture salinas hall tree with storage bench welcome you home. Hall Tree In Ebony Finish. Features Updated Flare Legs And Satin Nickel Hardware. This Elegant Scrolled Entryway Storage Bench Is The Perfect Solution To Fill That Empty Space Next To Your Front Or Back Door. Nothing Is More Frustrating Than Walking In The Door And Trying To Find A Place To Put Things. Solve That Problem With This Mission Entry Way Bench. This Stella Hall Cabinet with Mirror in Cherry - Ace Decore will help to restore order in the hallway. Four deep drawers can store hats, scarves, gloves and other things, while the mirror is a wonderful way to visually expand the space of your even small hallway. It is available in cherry color. Features: Hall Cabinet with Mirror Stella Collection Modern style Cherry finish Spacious surface 4 deep drawers Dimensions: Hall Cabinet with Mirror: W23.6 In. H77.8 In. D14.4 In. This stylish double drawer coat rack, Stella Wall Stand with Hanger and 2 Drawers in Cherry - is complemented by two convenient drawers. All parts are made of environmentally friendly and durable materials. It is available in cherry color. Features: Wall Stand with Hanger and 2 Drawers 2 deep drawers Stella Collection Modern style Cherry finish Dimensions: Wall Stand with Hanger and 2 Drawers: W23.6 H77.8 In. D14.4 In.For Additional Stella Products Please Scroll To The Bottom Of The Page. • Dimension: 34 In.L x 18 In.W x 72 In.H • Finish: Dark Walnut • Material: Wood • Dark Walnut Finish Hall Tree Coat Hanger with Storage Bench • This is a beautiful contemporary style dark walnut finished hall tree. • Item features a padded cushion seat, storage, coat hooks and a mirror. • This hall tree /entry way organizer is the perfect solution in any entry way. • Simple Assembly Required.